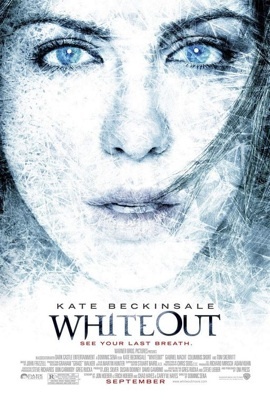 I went to see Whiteout last weekend with a couple of friends, and obviously, I didn’t feel the need to rush out my opinions on it. That’s because most everyone is in agreement: it’s not a very good movie. Estimates suggest an opening weekend gross of around $5 million, less than the horror film Sorority Row, which was made for about a third of Whiteout‘s $35 million production cost. That’s considered a disappointment, and word of mouth hasn’t been good. Don’t get me wrong, I don’t regret seeing it — I had a fun time. But since I’d already read the excellent graphic novel, there was no suspense, no tension in the film for me, which is death for a thriller. I already knew which major surprises were coming, so I just had to wait around for them while the characters spouted incredibly leaden, flat, expositional dialogue. And various announcements over the PA told us things we already knew, in case the viewer wasn’t paying attention or was dense. I had a major problem with the casting of Kate Beckinsale as Stetko. She’s too wispy, too fragile to seem like a marshal, especially in the Florida flashback scenes, where she’s wearing only a tank top under her bulletproof vest. Also, even when the dialogue kept trying to emphasize how she’d been awake for so long without any sleep, she never looked tired. The first major scene of the movie’s current day shows her in the shower, just so we won’t forget she’s female, since she spends most of the rest of the time in a parka. I missed the presence of Lily, the British agent, but her role became a male UN investigator (really? they have those?) played by Gabriel Macht, who sounded dubbed to me the whole time. He wasn’t, but there was something about his voice and his look not matching up. I did find it refreshing that they worked together without any hints of pairing them up in a different way. I also liked the pilot, played by Columbus Short, because he just wanted to do the sensible thing. Shame it didn’t work out so well for him. Tom Skerritt did an excellent job as Doc, but I already knew he had “crusty curmudgeon” down. The big appeal of the graphic novel was showing the reader what it really felt like to be someplace they’d likely never see: Antarctica. How life there worked, especially during a time of life-and-death murder investigation. The movie tried to claim the same appeal, but knowing it was filmed in Canada, it felt fake, even though the scenery could be gorgeously forbidding. The climactic fight in the snowstorm took much too long and emphasized the unbelievability and inconsistency of some of the environmental “rules”. At one point, going outside bare-handed and touching metal will take your skin and end up giving you gangrene. At another, it’s no big deal to grab a railing with no gloves and walk down some steps. But what summed it all up for me was this: no matter how scary the cold was supposed to be and how much bundling up — goggles, hood, gloves, parkas — they did, no one ever covered their lips. I kept staring at the exposed mouths and chins and wondering why no one had chapped or cracked lips when we’d been told the wind could freeze them instantly. I suspect it was to keep the stars recognizable and distinguishable, but for me, it was the last straw in realizing that the whole thing came out pretty dumb.